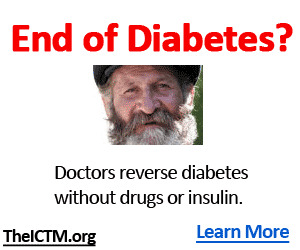 "See Table 20.1 for structural details of modified insulins. hUltralente (U) and Lente (L) insulins have been discontinued in the United States, supplanted by newer modified insulins and insulin mixtures. iv, intravenous; OTC, over-the-counter; rDNA, recombinant DNA; sc, subcutaneous; U, international activity units. Figure 20.2 • Structure of SUR1/Kir6.2 assemblies as pertains to sulfonylurea and glinide binding. A sulfonylurea or glinide ligand simultaneously engages the portions of the SUR1 and Kir6.2 subunits comprising the "B" ligand-binding domain. in this way, compensate for a loss of proper intracellular responsiveness to food-associated hyperglycemic excursions. 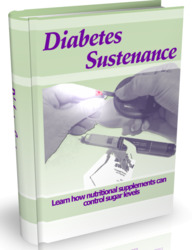 Insulin secretagogue sulfonylureas are more specifically referred to as ^-(phenylsulfonyl)-^'-alkylureas. Sulfonylureas commonly referred to as "first-generation" (Fig. 20.4) and "second-generation" (Fig. 20.5) molecules differ mainly with respect to elaboration on the benzene ring at the para position of the phenylsulfonyl moiety. Glimepiride is sometimes classified as a third-generation molecule, but structurally, there is no real basis for this distinction. Figure 20.3 • Simplified diagram of sulfonylurea action on pancreatic p cells leading to insulin release (adapted from Bounds et al.,7 with permission). Glucose entering the cell via a membrane transporter (1) results in ATP synthesis (2), and sufficiently elevated ATP/ADP ratios favor ATP binding (3) over ADP binding at the nucleotide binding sites on the channel assemblage, in turn favoring K+ channel closure. Sulfonylureas or glinides also bind to the channel assemblage (4), also favoring channel closure. Increased K+ channel closure traps a greater portion of K+ ions within the cell, rendering the intracellular milieu less negative versus extracellular fluids (i.e., depolarization ). 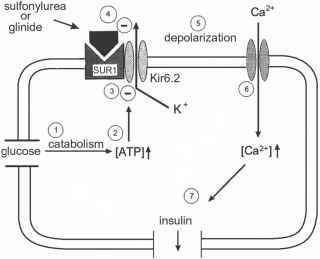 Sufficient depolarization favors calcium channel opening (6), allowing Ca2+ to flow into the cell. Sufficient increases in cytoplasmic [Ca2+] cause insulin exocytosis (7), and also increase trafficking of insulin granules to the cell membrane. 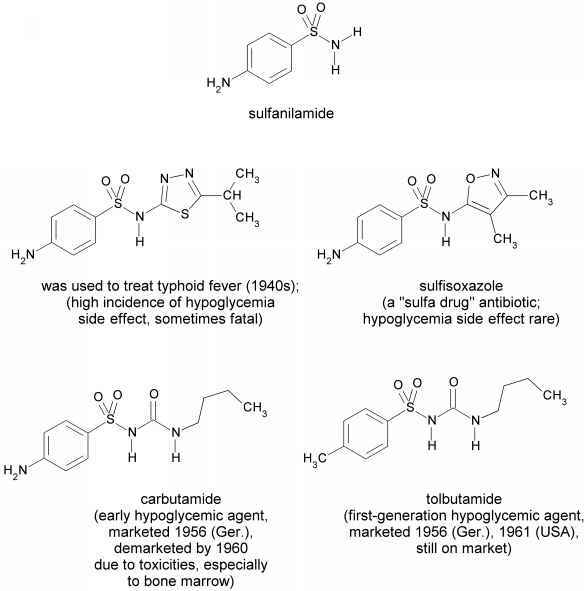 Sulfonylureas were fortuitously discovered because of the hypoglycemic side effects of various sulfonamide antibiotics ("sulfa drugs"), including the isopropylthiadiazole derivative of sulfanilamide and, during its clinical testing, carbutamide (see Fig. 20.6). In the subsequent process of creating such first-generation insulin secretagogues as tolbutamide and chlorpropamide, and thereafter second-generation compounds such as glyburide and gliquidone, many thousands of analogs were synthesized and evaluated pharmacologically. The structure-activity results are somewhat self-evident from the information in Table 20.3, to the extent that molecular-level potency (insulin-releasing action) correlates with dose. In fact, upon accounting for the consequences of relatively modest oral bioavailability and pharmacokinetic differences, observed hypoglycemic potencies correlate very well with molecular-level affinities of the SUR1 binding of these compounds, and with functional potencies obtained from in vitro physiological assays. Invariably, optimized alkyl, cy-cloalkyl, or cycloazalkyl N3 (N') substituents provide the highest affinities and potencies. Substitution of N1 with a benzenesulfonyl moiety (or a comparable arylsulfonyl moiety) is necessary, with para substituents generally increasing the potency. Further elaboration at the para position with a j6-(acylamino)ethyl moiety (as in, for example, the structure of glyburide) was found to greatly enhance the activities among compounds of this general structural class, based on which finding all of the marketed second-generation hypo-glycemic sulfonylureas were created. acetohexamide Figure 20.4 • First-generation sulfonylurea structures. Figure 20.5 • Second-generation sulfonylurea structures. 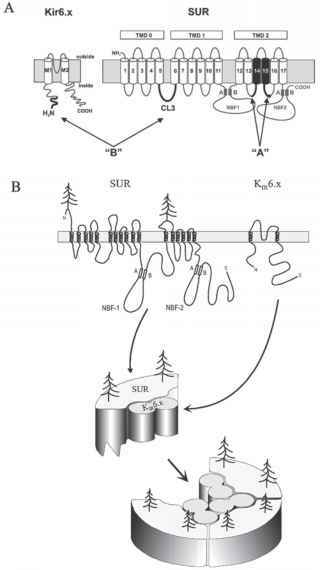 Figure 20.6 • Structural genesis of hypoglycemic sulfonylureas. The sulfonylureas behave as weak acids within the physiological pH range, with pKa values typically 5 to 6 (Table 20.3); thus, at the pH of blood, the negatively charged conjugate base predominates to the extent of >95%. 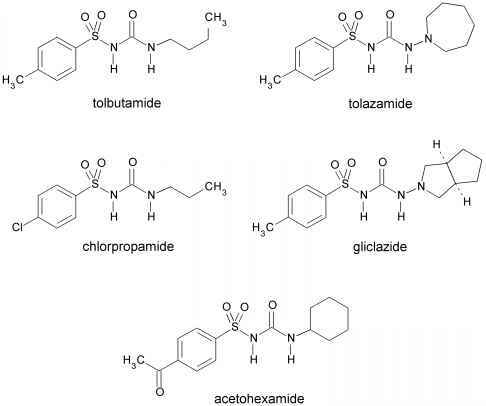 In addition to the presence of the anionic moiety, portions of these ionized molecules are also relatively lipophilic; such structural combinations often lend themselves to extensive binding to serum and tissue proteins, and this is found to be the case with all of these drugs. In their free acid states, all of the marketed sulfonylureas are quite lipophilic (see log P values, Table 20.3). This characteristic facilitates absorption from the gut lumen, especially in initial portions of the small intestine where the pH remains below or near the pKa of the drug. Despite the lipophilicity of these molecules in their free-acid form, diffusion through the blood-brain barrier (BBB) is reported to be minimal for drugs of this class, presumably attributable to the combination of high serum protein binding and low percentage of free acid species in blood. Efflux transporters are known to be involved in some cases.8 For some of these drugs, however, the high potency coupled with the presence of ATP-sensitive K+ channels within the brain might possibly account for certain undesirable side effects (notably, weight gain). What is ph range of sulfonylurea?